Homeowners hate the mess that this time of year brings, leaves and debris landing all over the garden and around the home. To keep your garden looking clean and beautiful, you need to regularly upkeep it and remove anything which upsets its appearance. Many garden tasks like getting bags of fertilizer or emptying a bunch of leaves and debris require going back and forth from one place to another. Garden trailers help you carry big loads from place to place easily. A trailer is a large container which can hold heavy loads and can be attached to ride on mowers. Using a trailer is the best option to save yourself time and big physical efforts. They can do tasks for you most of the time in just one trip. Here are 2 must-have garden trailers for garden maintenance. 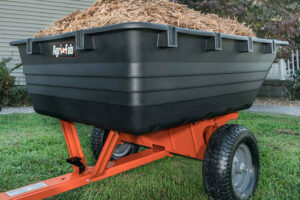 The 17-inch Poly Tow Dump Trailer is a stylish and ultra-functional garden maintenance tool. It is produced with a tailgate and recessed hardware which allows for easy dumping. With this trailer, no material will be left behind. The tipping mechanism is foot controlled and works with a single stepping motion making it easy to use. This trailer is accustomed to rusting and can easily cope with significant impact thanks to its highly-durable poly body. Its wide-profile pneumatic tyres will not damage the work surface when working while also improving manoeuvrability. A universal hitch-pin allows it to be attached to all makes of tractor mowers. It has a huge load capacity of 800 lbs. It weighs 32 kg and the full size of this trailer is 72 x 41 x 29.5” (L x W x H). The Convertible Poly Push/Tow Dump Trailer is a versatile trailer that has a tough poly bed. This trailer will not rust due to its di-chromate hardware and as well as that it is really easy to clean. The high sides on this trailer allow you to have no issue transporting big loads and bulky items. Its large diameter pneumatic tyres allow smooth movement over all types of terrain. A heavy-duty axle provides the trailer with great strength and durability. A universal hitch-pin is attached meaning you can add it to all tractor mowers. It has an impressive load capacity of 300 lbs. The Trailer can be used with all makes of ride on mowers. It weighs 27 kg and the dimensions of this trailer are 1422mm x 875mm x 762mm (LxWxH). To see our full range of garden trailers, visit us online today or for more information, call us today on 021-496-5132.